Momentum was one of the first templates to launch with the previous version of Squarespace, Squarespace 6, way back in 2012. As such, it is one of the oldest templates still available for use with Squarespace today. Websites have changed a lot since 2012, especially when it comes to designing with mobiles and tablets in mind. Although the Momentum template is fully responsive (meaning it flexes to work on all sizes of device), certain things have moved on, and the newer templates have been created with everything from huge HD screens and mobiles in mind from Day 1. This means Momentum feels a little behind the times, especially when it comes to the amount of elements you can control style-wise - Momentum has one of the smallest number of design controls of any template. However, it's still a decent choice for portfolio websites, especially if you don't have a lot of time (or desire) to tweak lots of elements design-wise. Momentum is currently the only Squarespace template that offers navigation at the bottom of the page, which is this template's main distinguishing feature. It also offers a special navigation element/icon for internal gallery navigation, so if you like these elements, and the way the Momentum demo site looks on all devices, and you want to quickly and easily slot your content into that framework, then Momentum might be the right choice for you. Strong Point / Best For… Photographers' favorite: fullscreen slideshow galleries & Index galleries, with configurable options. Design Notes Full-height canvas, narrower content column over background image. Few style controls. Homepage Fullscreen slideshow Index, with pop-out info panels, and icon linking to pop-out thumbnail grid. Index Page YES, galleries only. Displays as a fullscreen slideshow with customizable options. 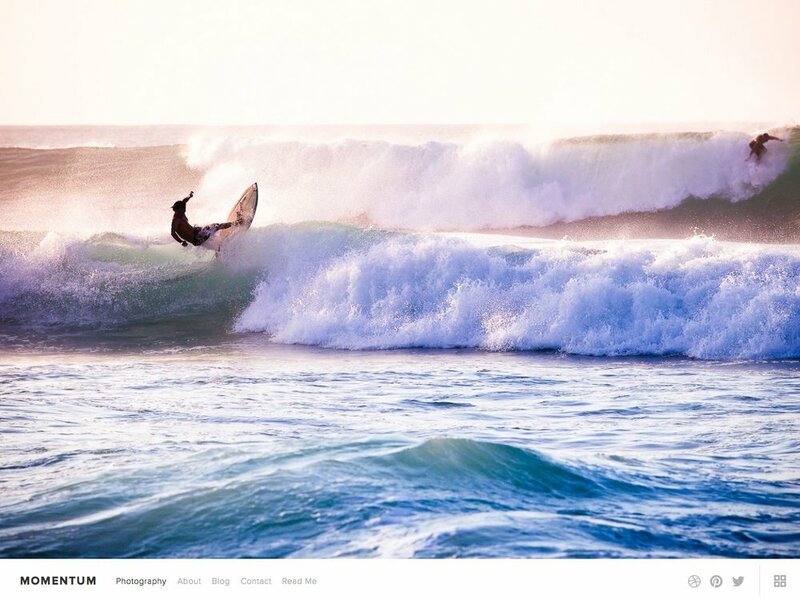 Index combines all images from all gallery pages into one mega slideshow/thumbnail grid. Header Slimline header bar at bottom (or top) of page. Main Navigation Slim top or bottom with small logo on same line. Can have social icons. Social Icons Inline with main navbar, or hidden. Change icon color, size, and style. Footer Standard, no visual separator or style controls. Appears bottom of content column. Page Titles & Descriptions YES - both or none. Appears above body. Gallery Design Slideshow AND grid, with icon toggle between them. Gallery Display Slideshow expands to full bleed, filling screen except navbar. Images with descriptions show icon that links to popout info panel. Grid icon opens thumbnail grid. Other Features / Notes Index galleries showcase lots and lots of images well, with easy navigation options and space to display text without it being distracting or obtrusive.